What marks the ultimate in greatness. In most cases it is something or someone that has had an significant impact and has created enough of a shift in the way the whole world works or lives. In the case of aviation the impact it was total. From the destruction of distance, time and even the cost of moving around the planet can not be challenged in any shape or form. But like most brilliant inventions the changes that we take for granted today are usually in steps, and some steps are small but important, but some are huge and changes almost everything in the way we used movement and in the way you traveled before that introduction of absolute change. In modern thinking you could say the same about the before and after the iPhone and the effects on the way we communicate. We are today too far removed from the changes of aviation in its formation years between the World Wars, but the effects from that era are all around us every time we go to an airport and fly. 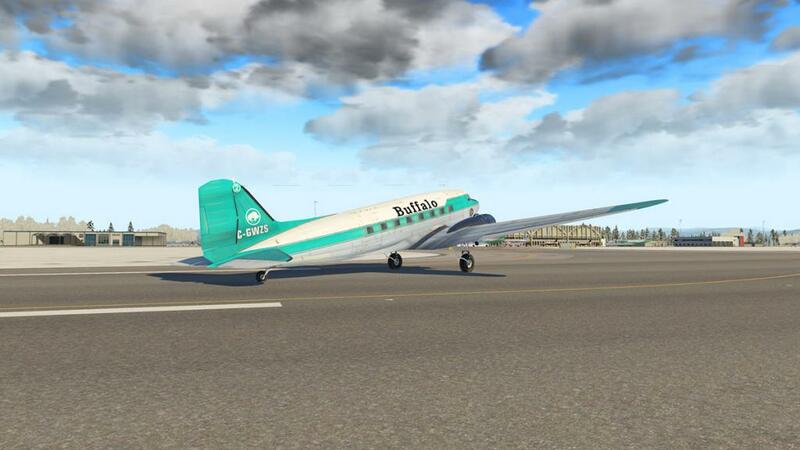 In the area of greatness then that title has been lavished onto the DC-3 or Douglas Commercial 3. The aircraft was one of the greatest machines to have ever been built, but the reality could have been different. 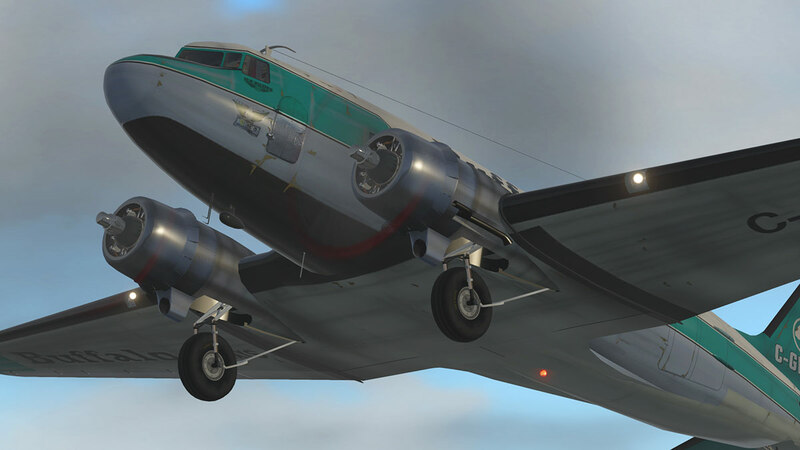 In truth only 607 DC-3's were ever built and the aircraft was already in line to be superseded except for the insertion of the Second World War. The military need aircraft, in fact thousands of them and they needed to be reliable, fast (in 2WW terms) and mostly cheap and quick to produce. 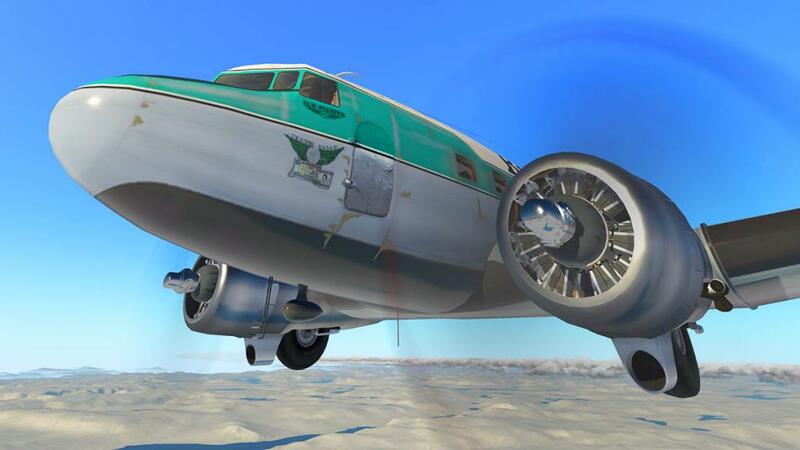 So the DC-3 became the C47 Skytrain and over the course of the war they manufactured 16,000 of these Goony Birds. War time surplus demands then put a huge majority of these cheap flying aircraft on the market and the rest as they say is history. 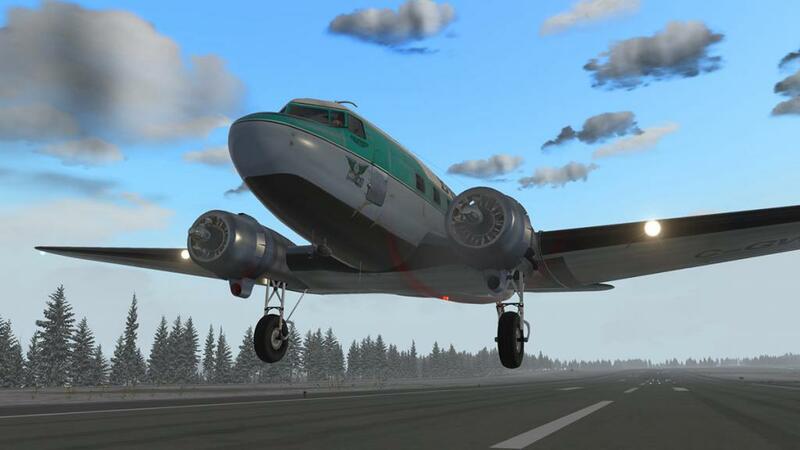 Even in innovation it was the DC-2 that was the innovation aircraft in being an all metal aircraft with a tapered wing, retractable landing gear, and two 690 hp (515 kW) Wright radial engines driving variable-pitch propellers. It seated 12 passengers. The DC-1 was in reality just a development prototype aircraft and only one was actually built. 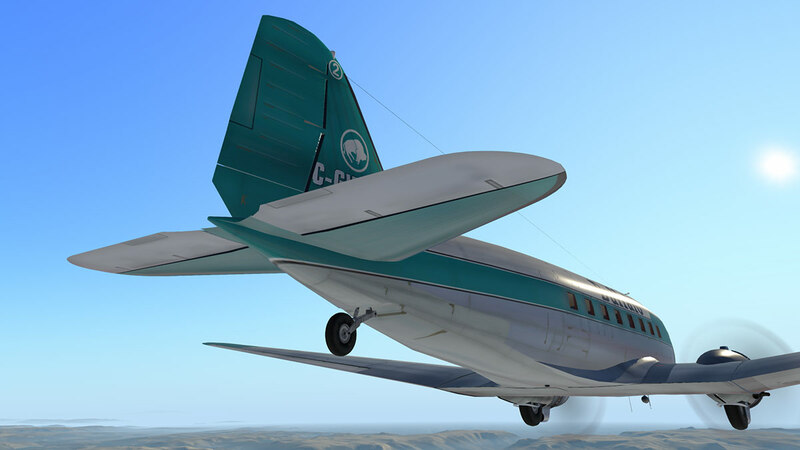 The DC-3 was just an upgraded version of the DC-2 with 21 passenger seats, 1,100-horsepower (820 kW) Wright R-1820 Cyclone engines but also filled in that sweet niche point of making and in creating RPT airline routes (now known as regional) profitable. So you have cheap to buy, fast at 200 knts (370 km/h (230 mph) at 8,500 ft (2,590 m)) with a cruise speed of 180 knts (333 km/h (207 mph)), cheap to run and bingo you had an airline. 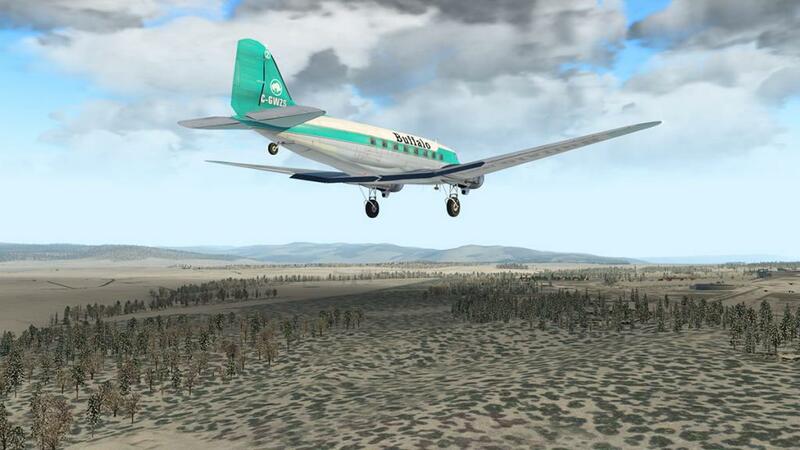 Beyond just the obvious the DC-3's claim to ultimate greatness was simply reliability. These strong tough wartime birds would simply keep on flying no matter what you threw at them, pilots loved them and the rest is history. 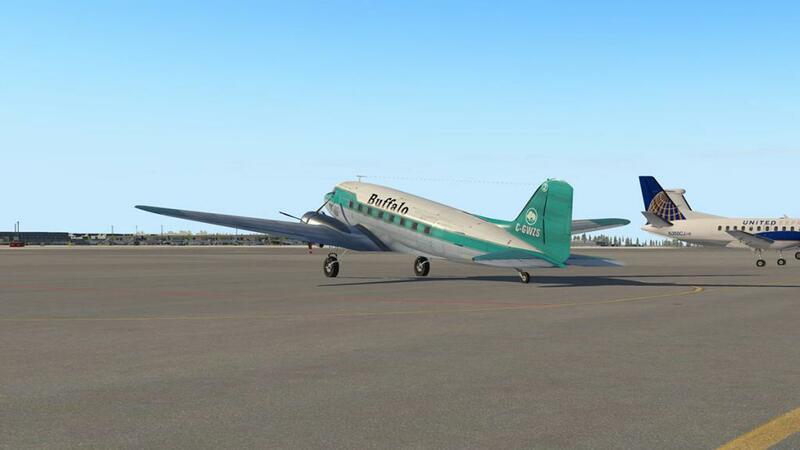 Incredibly even after eighty years since they first flew there are operators with 2,000 DC-3s still in revenue service and as many converted as cargo aircraft. 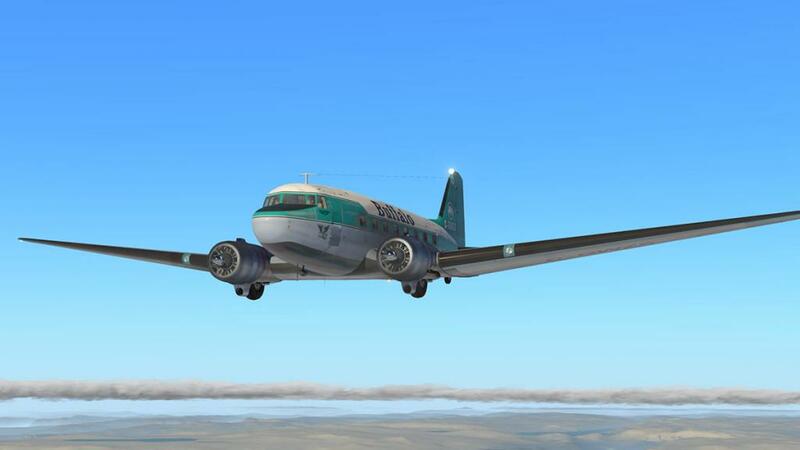 But most DC-3's today are now either in restoration or flying around at air shows. The oldest current DC-3 still flying is the original American Airlines Flagship Detroit (c/n 1920, the 43rd aircraft off the Santa Monica production line and delivered on March 2, 1937), which can still be seen at airshows around the United States and is owned and operated by the nonprofit Flagship Detroit Foundation. 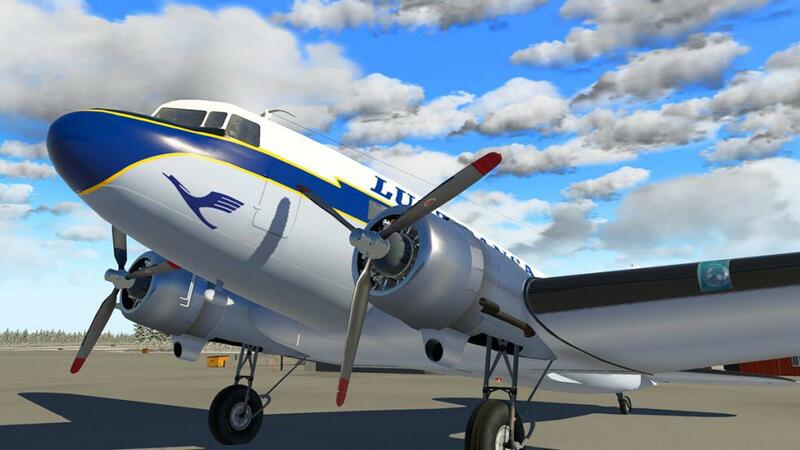 VSkyLabs Douglas DC-3 "Flying Lab Project"
Vskylabs have been around for a few years. There are not in a general sense full developers, but more of a an older style X-Plane community that loves aircraft in all their shapes and forms. So their output is very varied, mostly cheap but interesting aircraft like the Tecnam P2006T Project, Phoenix S-LSA Project, Hang Glider Project and the Autogyro Project and many more. But note the word "Project" behind every aircraft. As noted most developers develop aircraft for X-Plane for income, a few do it for the love of aircraft per-se. But Vskylabs create projects of aircraft that you can invest in. 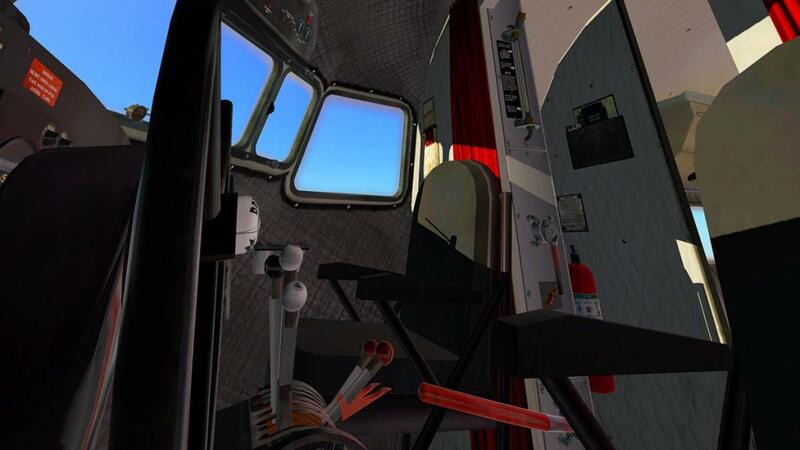 They are built to a price and are not developed to the high end degrees of detailing and systems, yes Vskylabs do create interesting aircraft but not to the so called "Study" depth of simulation. 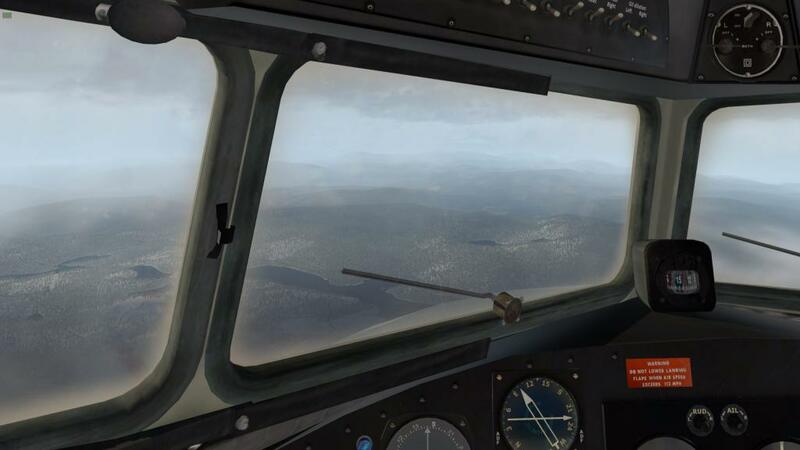 This background is important to note when reading the review below, the aircraft is an ongoing project and there is more to come as it is developed out more, but it is important to note that the aircraft is certainly developed as to a current fine flying state, and so most of the on going development is more in the detailing and filling in areas than the main systems and flying performance, and it is priced accordingly in that category. 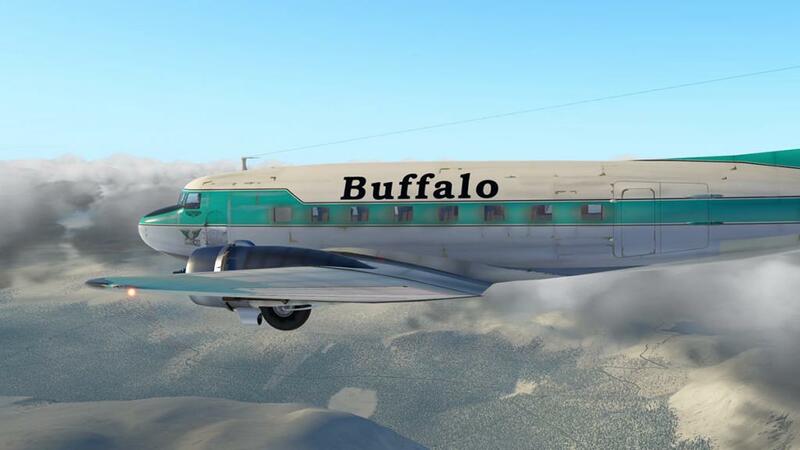 The aircraft comes in the now famous "Buffalo Airways" livery from the "Ice Pilots NWT" TV series run by Joe McBryan (aka "Buffalo Joe"). 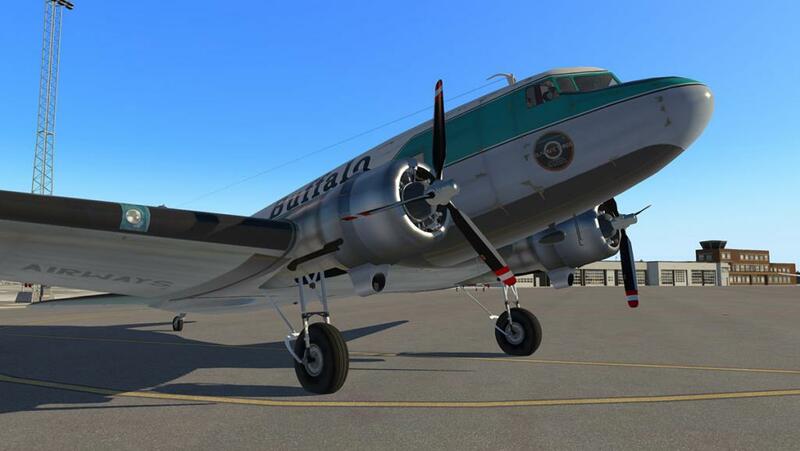 But there is no doubt this bird looks great, certainly in the great light of X-Plane11. X-Plane10 is also available as well but you will not get those great lighting reflections you see here. You don't get a load of intimate riveting and panel detail, there are some really very nice detailing work where required. The engine cowling and the internal detailing of the Wright R-1820 Cyclone radial engines looks magnificent, but the highlight here is the lovely chrome prop spinner. The undercarriage is also well detailed, I would have really expected a bit more grease and wear and tear, but otherwise the struts look good. The retraction animation is very good as well as the gear goes up slowly into its bay, or extracts easily down for landing. There are no menus or ground elements with this DC-3, and the doors don't open either, which would have been a great feature and certainly in it's current cargo role. 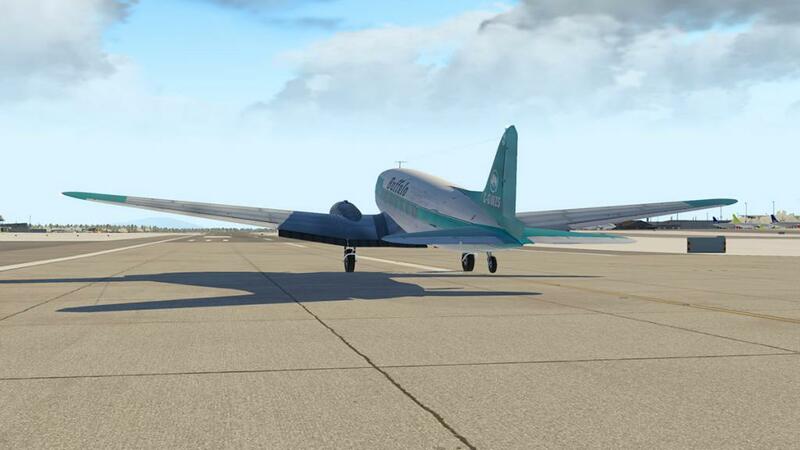 But the old bird does look great on the ramp, it is a DC-3 and DC-3's are a very unique aircraft. 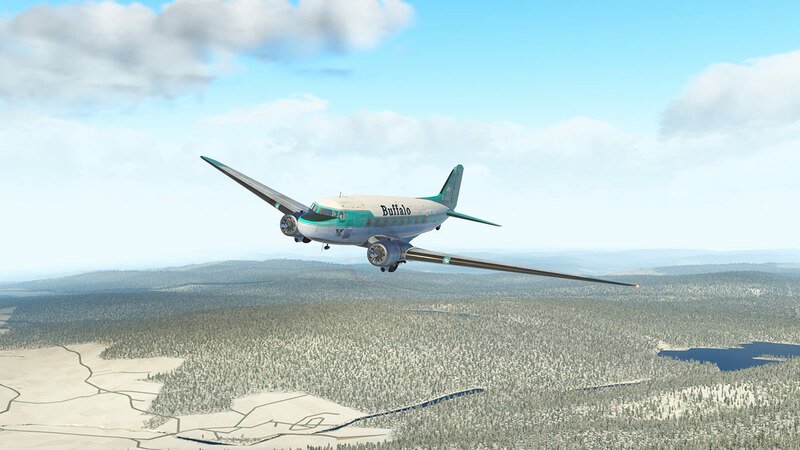 Internally the Vskylabs DC-3 is quite good. The textures are in places a little average in resolution and so slightly blurred, but otherwise it is well done. This aircraft is from the 1930's in technology, and so panels with instruments mounted on them is par of the course. 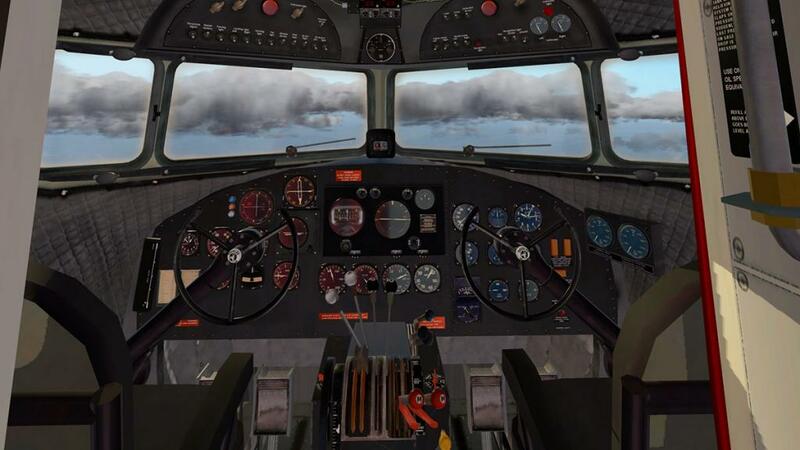 It is all straight forward in that there is no detailed wear and tear or worn levers and yokes, which would have added in a bit more period authenticity, but it is well done and you feel the age of the aircraft from the flying position and in the way you access the controls. A highlight is the aircraft's glass. The windows are aged worn and feel great when looking through them in an authentic way, a bit of poor weather highlight's their old faded transparency... I like them a lot. In the cabin is is pretty much in the same vein with average textures and seats that look too small, certainly in the width. 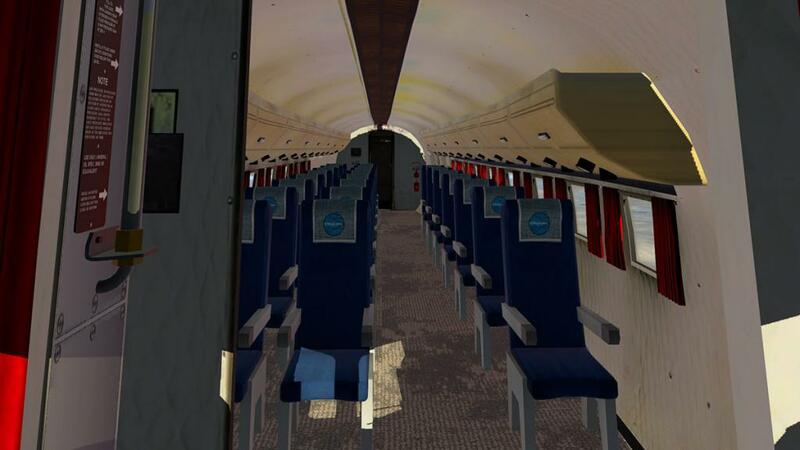 For all the ages then aircraft back then had a lot of seating width within reason, more like the luxury trains of the same era, and nothing like the tight pitch of today. 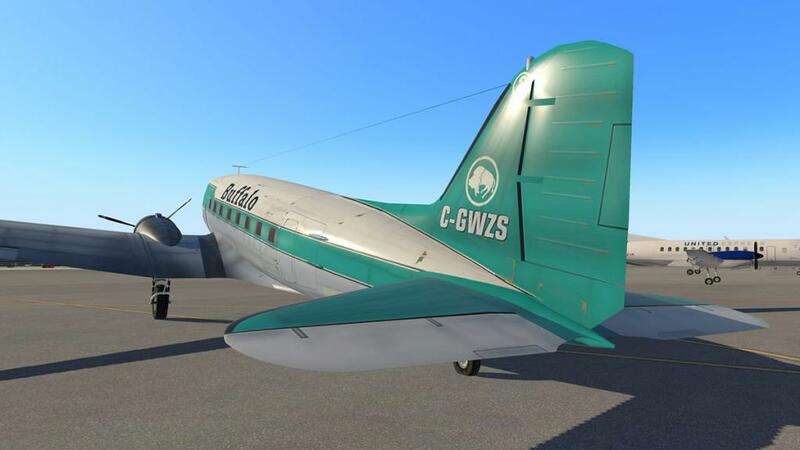 The DC-3 could be four seats abreast, so a three abreast like here would give you a lot space to play with, remember there was no aisle carts either back then to bang up and down the aisle between the seats. Again the faded windows are great as are the fancy red curtains, there was no overhead lockers then either but instead shelving for pillows and hand baggage. You can see why these aircraft were so highly regarded as their instrumentation is very good even by modern standards. Not in the glass cockpit sort of fit-out, but any good GA is not that dissimilar to the familiar layout viewed here. 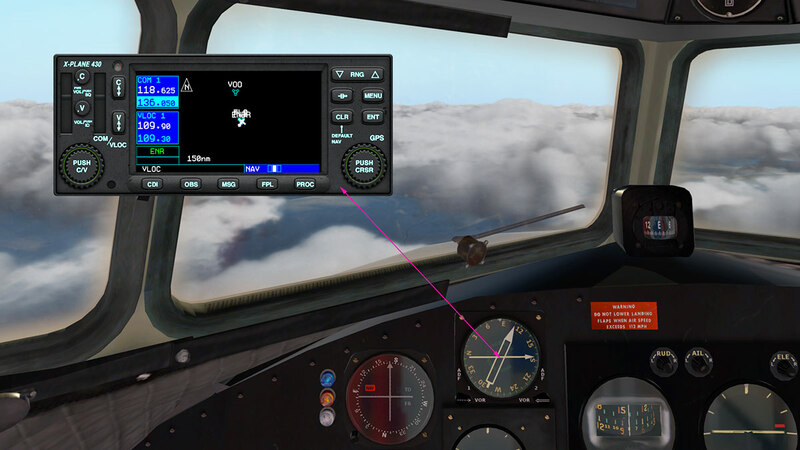 You can click on the base of the pilot's yoke to make both of them disappear, which is a great feature as they do hide the rate of turn instrument and even a little bit of the rate of climb instrument as well. It is a slightly odd feeling of finding the right perspective of looking out of the high windows and wanting all of the instruments in view as you can't have both. None of the standard six can be in view unless you change your perspective quite significantly as they are positioned well down the panel, and then in perspective they look odd in that fishbowl look. 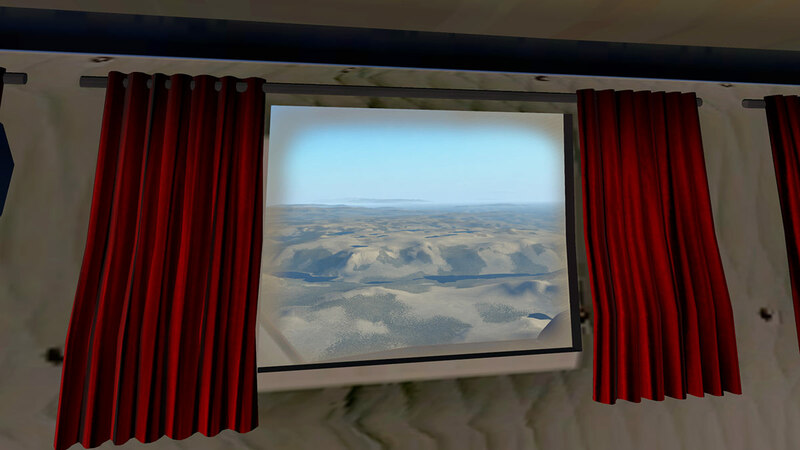 So viewing up and down will take a bit of practise in the way you fly the aircraft and setting up for landings via the instruments does mean a limited view out of the windows, so you can only have one view or the other. Instruments are highly reflective as well. Maybe too reflective in some conditions, but I would far rather have the feature than not. All the instrument are huge, large and easy to read... no squinting in here to read anything. Standard Six instruments are low set for the flying pilot but with a different set of instruments set high for the Co-Pilot. 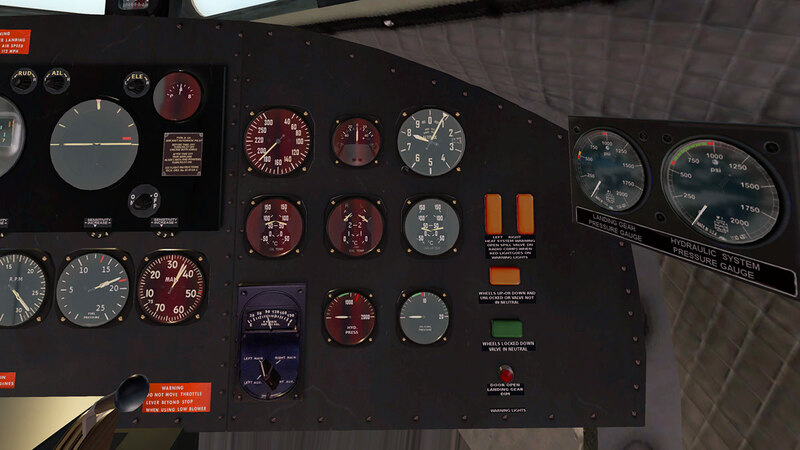 On the left is the Airspeed Indicator, Attitude Indicator and the Artificial Horizon on the top row and the Radial compass (heading), Turn Coordinator and Vertical Speed Indicators set out directly below. Left of the six pack is a clock and top of the panel center is an Omni Bearing Selector, or OBS and to the right a VOR 1&2/ADF 1&2 pointer. 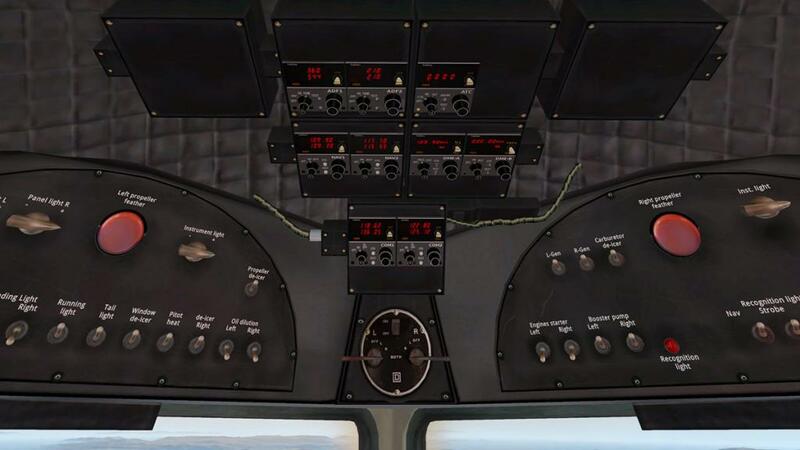 On the panel's far left is your flap position indicator, it is basic but easy to see. 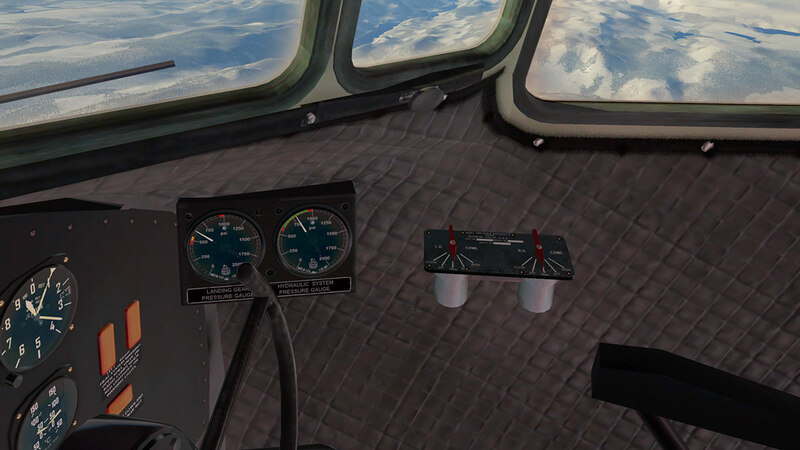 For the co-pilot there is only the Airspeed Indicator and Altitude Indicator with the free air temperature gauge between them. Second row has the (both engines) Oil temperatures, Cylinder temperatures and Carburettor Temperatures. Lower row has fuel gauge (switchable), hydraulic Pressure and De-Icing pressure. Centre panel is the Sperry Type A-3A autopilot, which we will cover more in the air. And below four gauges covering (both engines) Oil Pressure, R.P.M, Fuel Pressure and Man (Manifold Pressure). 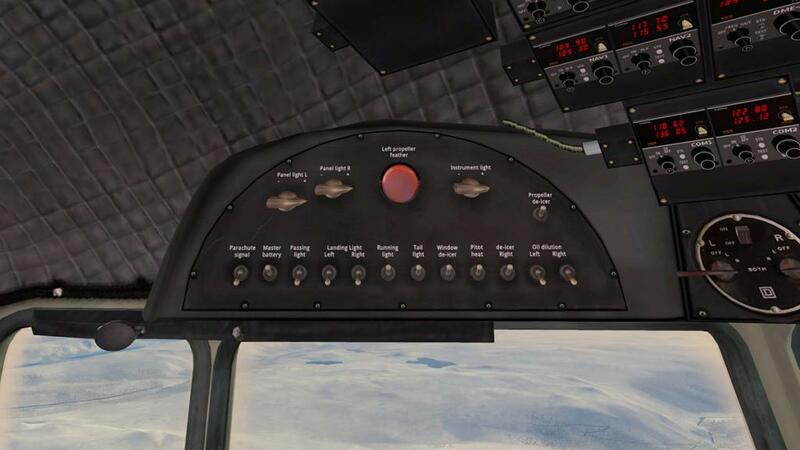 There are two overhead panels with one over each of the pilots upper left and right. Pilot's left side covers all the aircraft's power, external, panel lighting and de-icing switches, with a big red left propeller feather button. The right side panel covers L-GEN and R-GEN (Generator) switches and Carburettor de-icer. 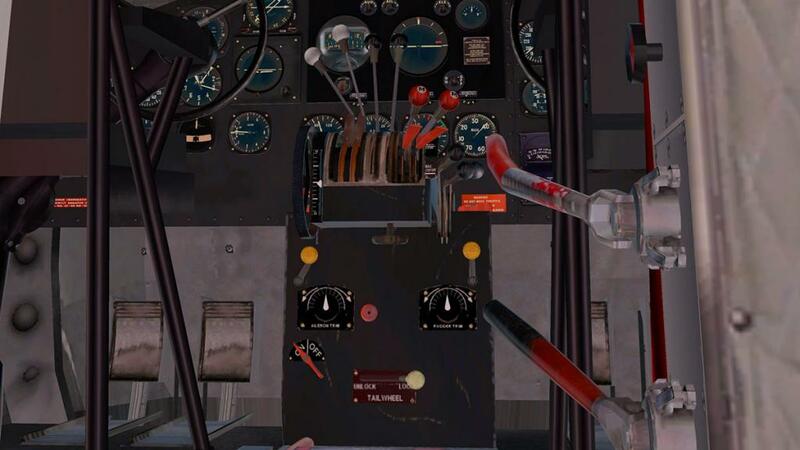 The red right propeller feather button and the main external aircraft navigation lighting, the co-pilot's instrument lighting switch is here as well. Overhead centre is lower the two engine ignition switches and above the radio panel to cover your COM 1&2, NAV 1&2 and ADF 1&2 frequencies. Also here is the DME-A and DME-B (Distance Measuring Equipment) and ATC frequencies (ATC is the aircraft's Transponder). 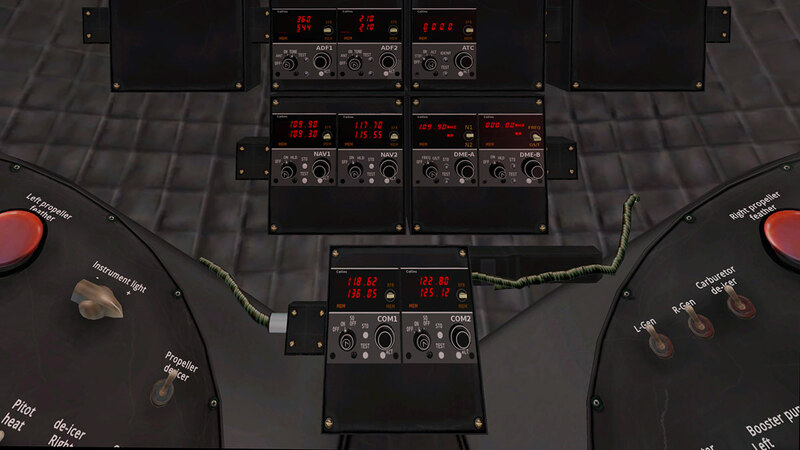 On the co-pilot's side wall are two sets of instruments covering with gauges Landing Gear pressure and Hydraulic System pressure. There is another panel for two switches that operate the engine cowling (cooling) positions from open to close. 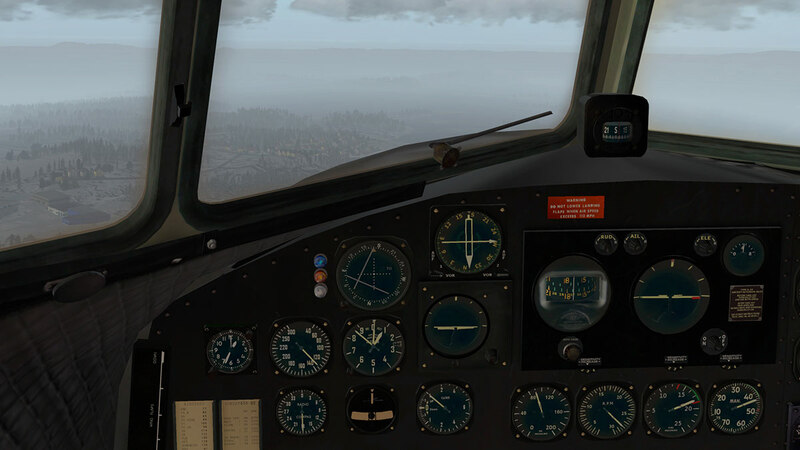 You can also use the X-Plane default GNS430 GPS system by pressing the VOR pointer dial and you can still set your COM1 and VOR1 frequencies here as well. Central pedestal is a lovely bit of gear. Like the nice thin metal yokes you get the full vintage long lever feel that covers both engines in P-Propeller, T-Throttle and M-Mixture. The mixture levers have two zones that you can pre-select either Auto-Rich or Auto-Lean like on the real DC-3. 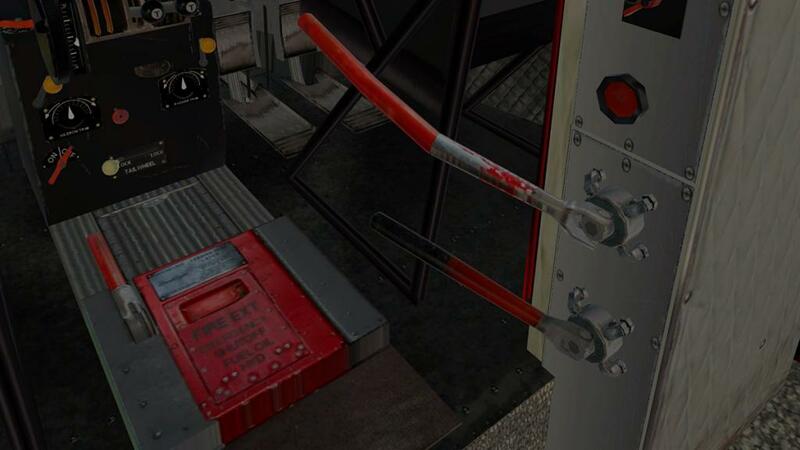 The main switchable fuel tank switches in MAIN or AUX are on either side of the levers. On the left of the pedestal is the main trim wheel (very nice) and the Aileron and Rudder trim wind handles are on the lower front of the pedestal. 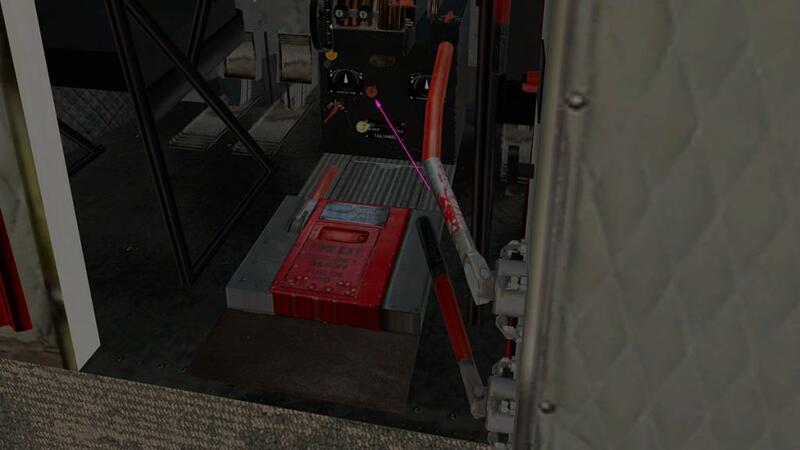 Two other items here cover the "Autopilot" on/off switch and the tailwheel lock lever. 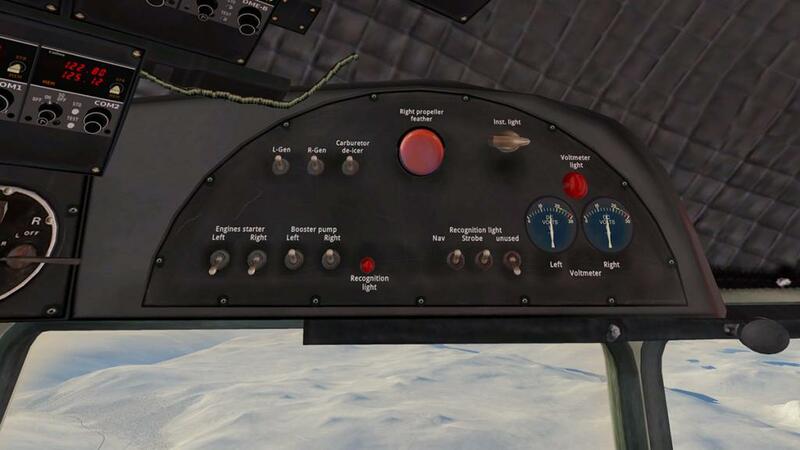 ... they would all be easy to use in a real world sense, but in a 3d virtual cockpit you would have to have a different solution. 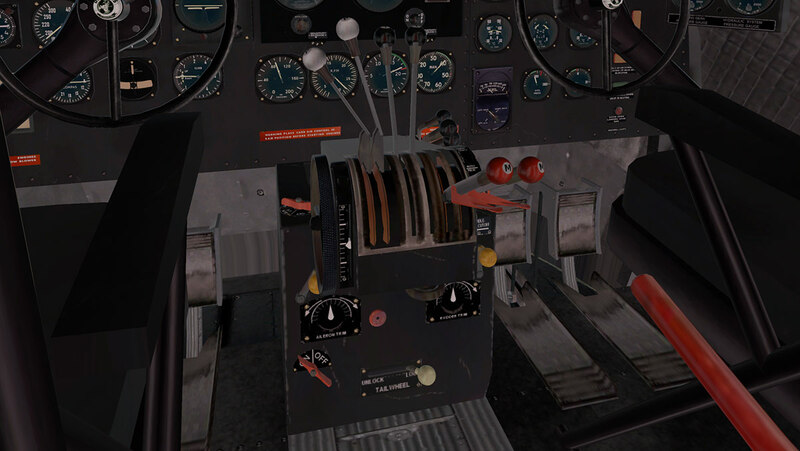 This aircraft is not a study sim, so you won't be put through all the pain of starting those old tired cantankerous Wright R-1820 Cyclone engines. 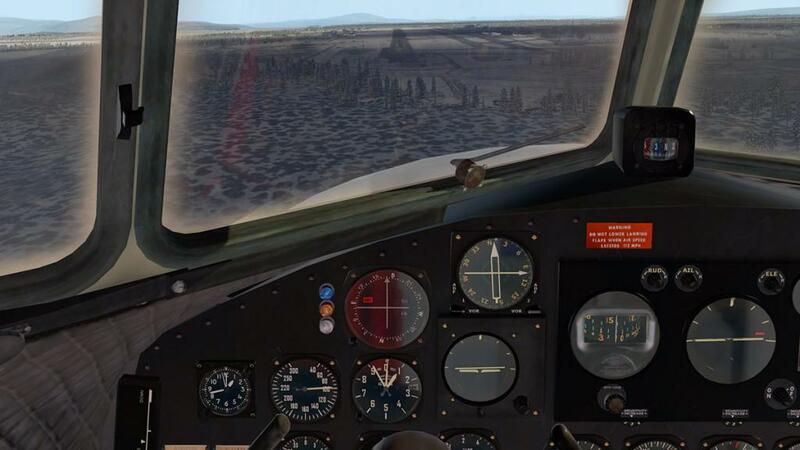 This point is a debatable one in either you want a complete realism simulation, but too many then starting these old style aircraft can be more frustrating than the fun aspect of the flying. 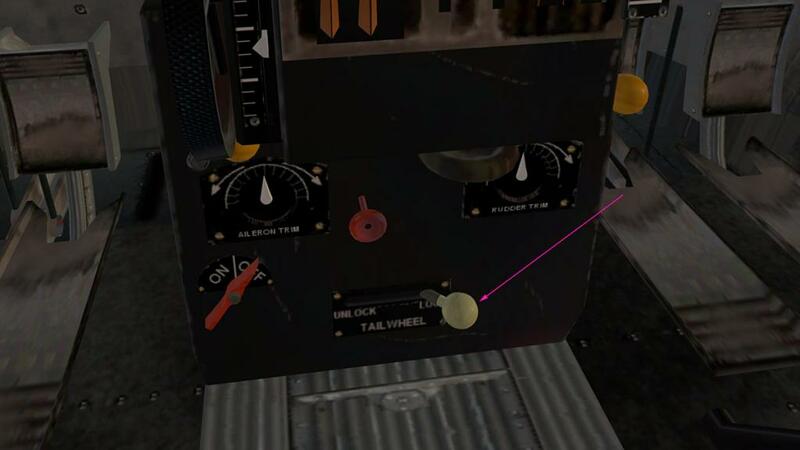 Starting engines on many simulated aircraft can be an absolute painful experience, but it depends on how you want to approach realism. Here it does help to use XPRealistic Pro by rk Apps and their realism effects. Set up correctly it does at least give you some more general feel and shudder to create a more realistic environment around such older style aircraft, in reality this app should be part of the deal with the aircraft, but on start up it does create an excellent prop shudder and running effects. 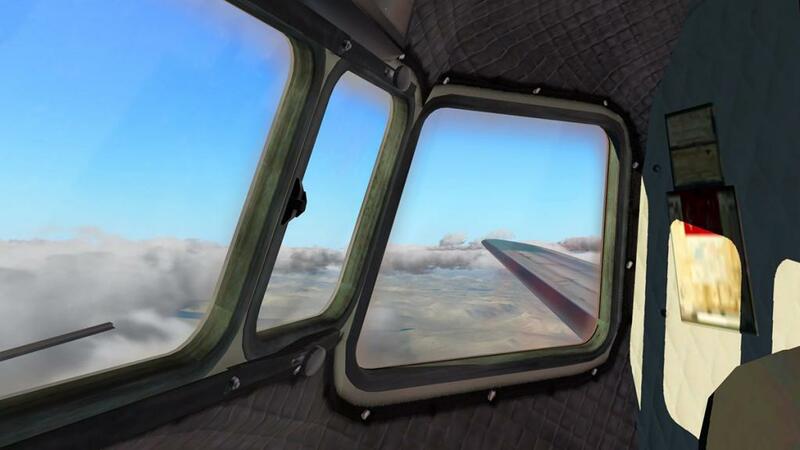 I have flown in a DC-3 and even if it was a $50 joyride, but it was a sensational ride that you never forget if you love aviation. It is noisy, bumpy but the aircraft does sort of come alive around you as a living breathing machine that is quite unlike modern era aircraft. Old taildragger hands will do the deal and fly the aircraft with the tailwheel loose. 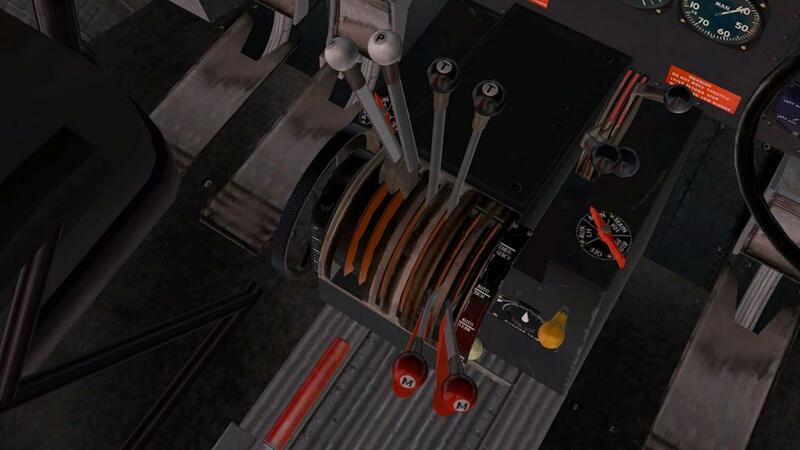 It is a trick to do, but using a twin-throttle arrangement does allow you to do that... but it is not easy. So a sort of sanity does and has to prevail. 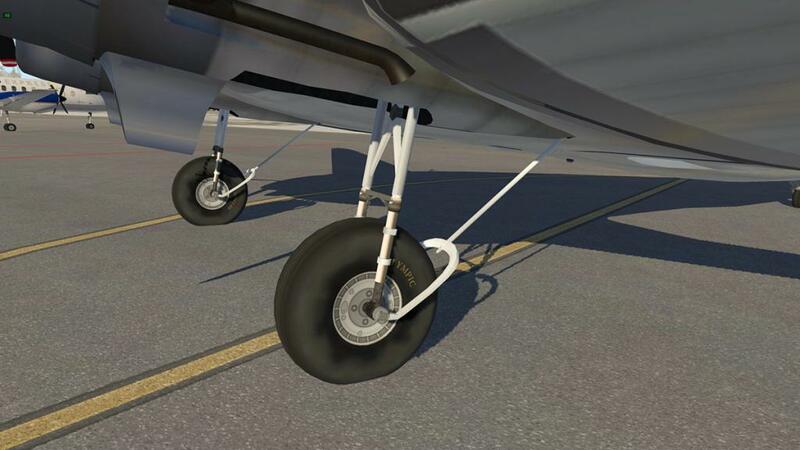 A flip of the tailwheel lock on the front of the pedestal will make the tailwheel behave to the laws of X-Plane and you can control it with the yaw aspect, in other words taxi where you want to go and not where the tailwheel wants you to go. 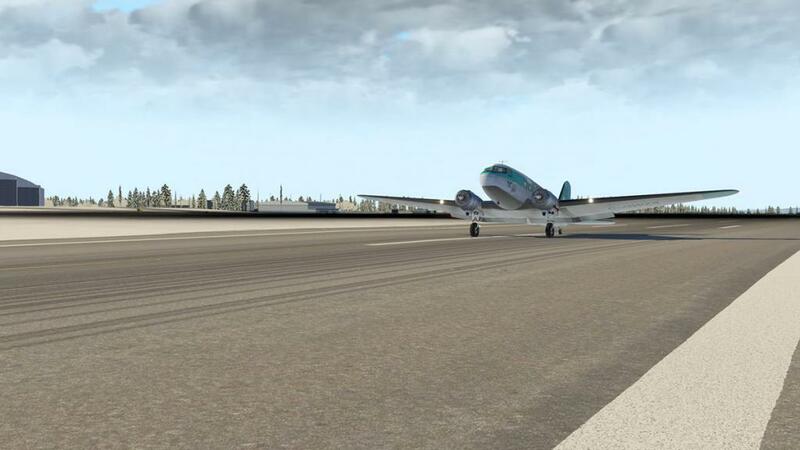 Certainly a major miff from the diehards, but I feel the X-Plane freewheeling tailwheel is not right either in it's actions, I never see tailwheel's go opposite rearwards when taxiing straight ahead on real aircraft but it does here, so it is bit of both. 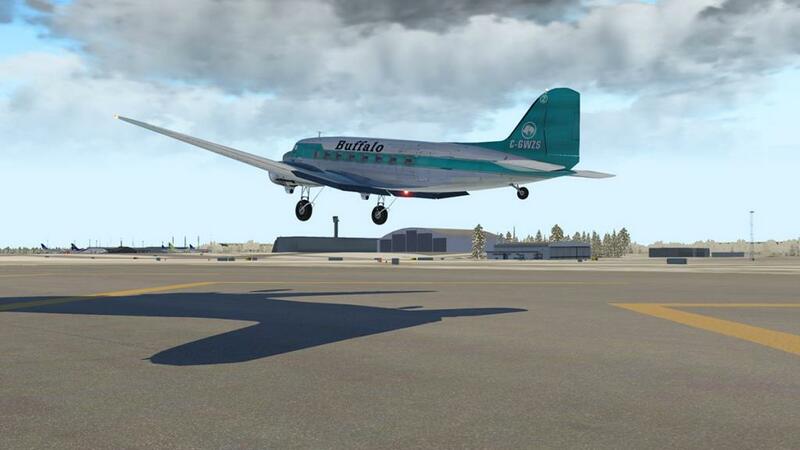 Anyway the tailwheel has to be locked for any takeoff or landing, keeping it unlocked will certainly mean a crash. 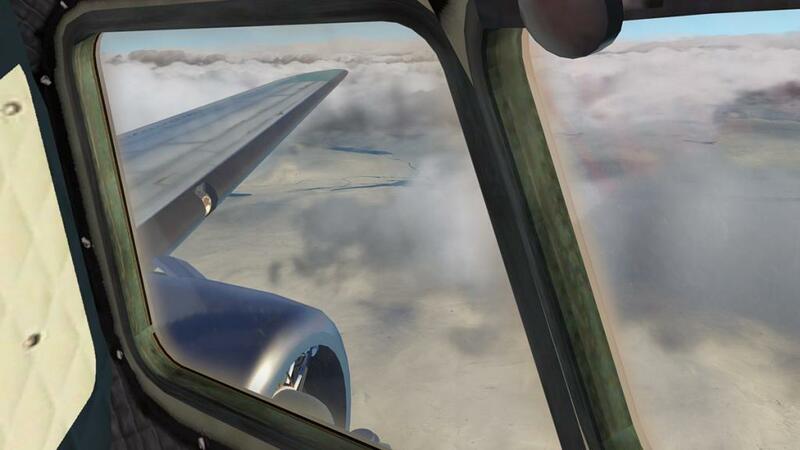 The view forward is very restricted, but that is part of the fun, not so much fun is that you can't see your instruments, so there is a bit of guessing going on on speeds, experts say it is normal, you just know and feel on what the aircraft is doing where and what. 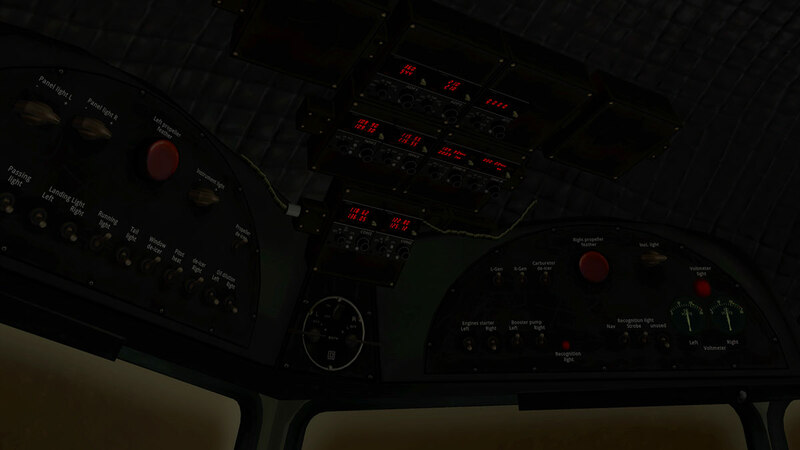 It is very easily if touching the controls manually to select the wrong levers? 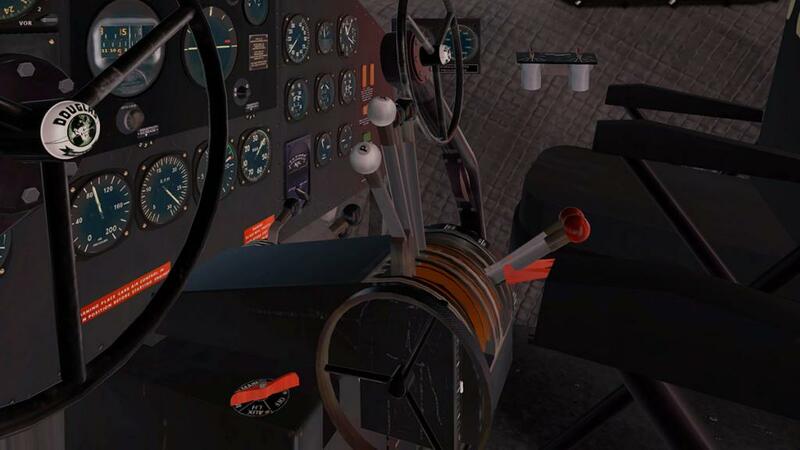 It is the P-Propeller and not the T-Throttle levers that comes to hand easily as the throttle levers are in centre here and not to the par de course to the left, so you have to look to make sure you are pushing up the correct ones, personally though as I am using a twin-throttle system it is not an issue, but I did try the manual operation and had to check to see if I was doing it right, again a twin-throttle system is great for keeping the old bird straight on the runway, certainly if there is a bit of a crosswind. 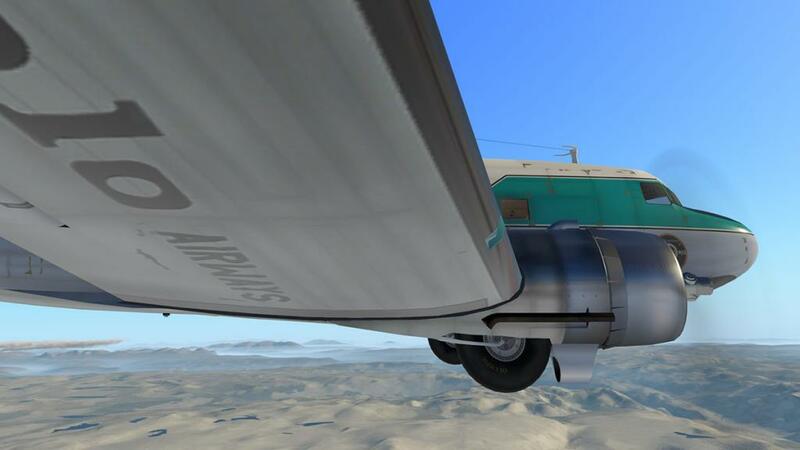 Tail lifts quite easily at around 60mph and that helps the view, but with that tail hanging out back there then needs some fine rudder control to keep it aligned straight. Thankfully at only 110mph you are airborne. Undercarriage animation as noted is excellent, as one wheel assembly will be slightly behind the retraction of the other wheel for authenticity. 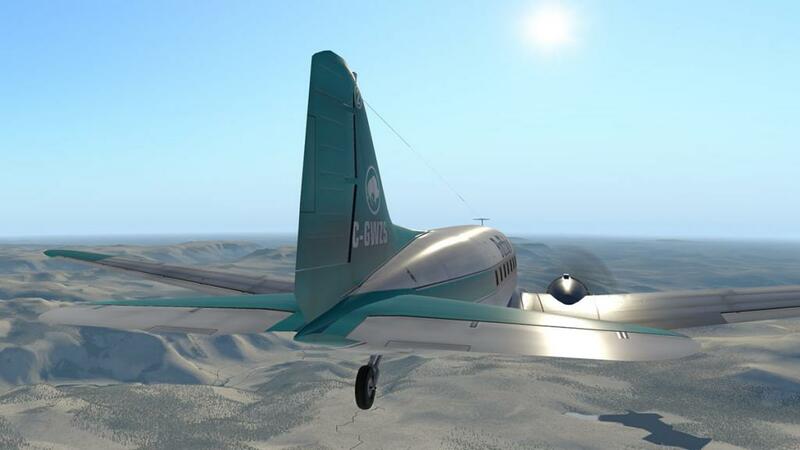 The DC-3 has a climb rate of 1,130 ft/min but you keep it around a 1,000 ft/min as so not to strain the Wasps, but she will climb and with no fuss or loss of speed. Total ceiling is around 23,000ft (7,100 m) but I will climb only to 8,500ft for this trip. 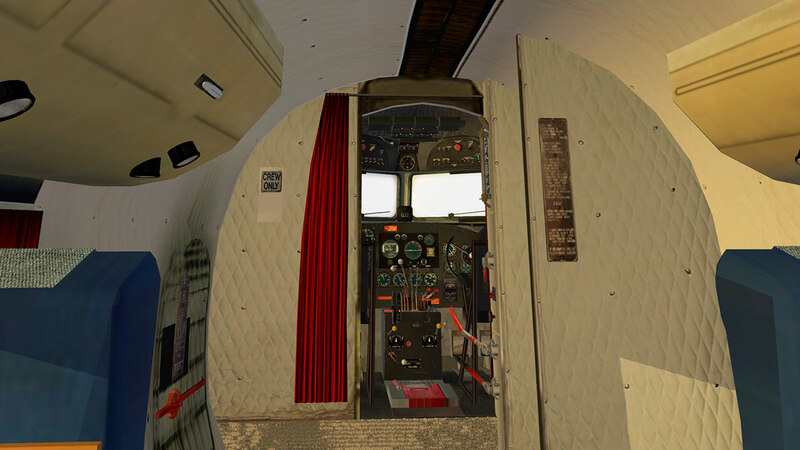 If you are familiar with PMDG's DC-6 you will find it easy in here. The same conditions count with the first important issue which is to fully trim the aircraft. As you know on the DC-6 it is a far more easier aircraft to fly than to fight it, if the trim is wrong. And so it is in this DC aircraft as well. Second is when you have trimmed the aircraft is too manoeuvre the aircraft to a clean and level flight, and trim again if you have to. 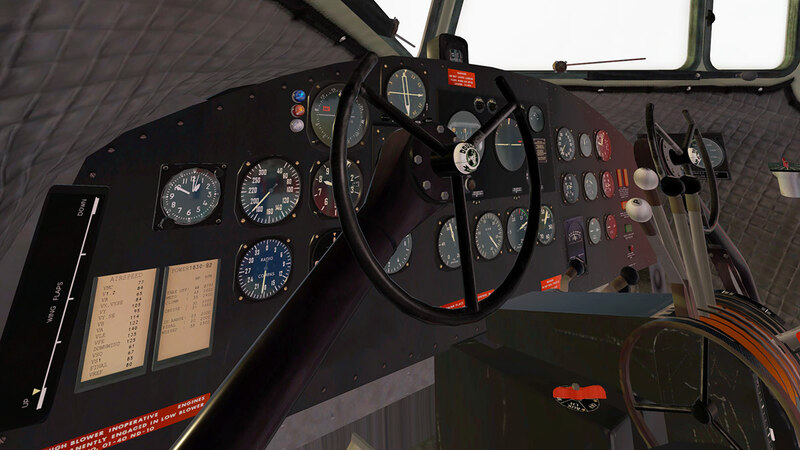 The Sperry Type A-3A autopilot is about as basic as you can expect it to be. 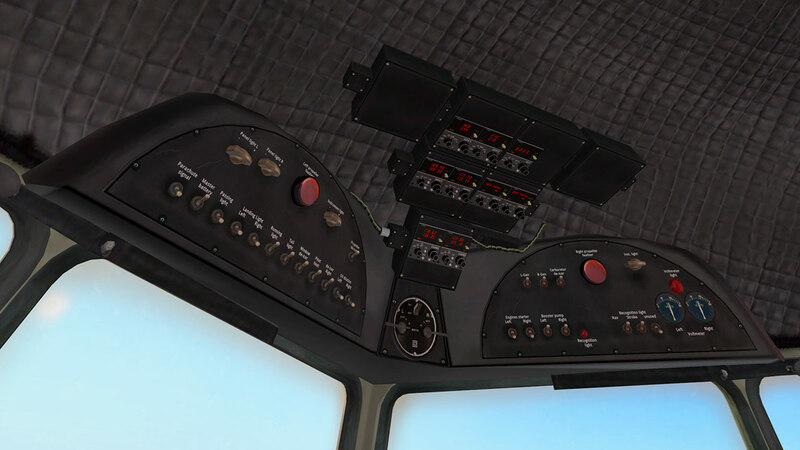 This is not a complicated in depth system, and in fact all it does is adjust the basic flying surfaces to your settings. It is activated by the switch on the lower front of the pedestal. And like previously mentioned the aircraft has to be steady, ready and trimmed to accept it. 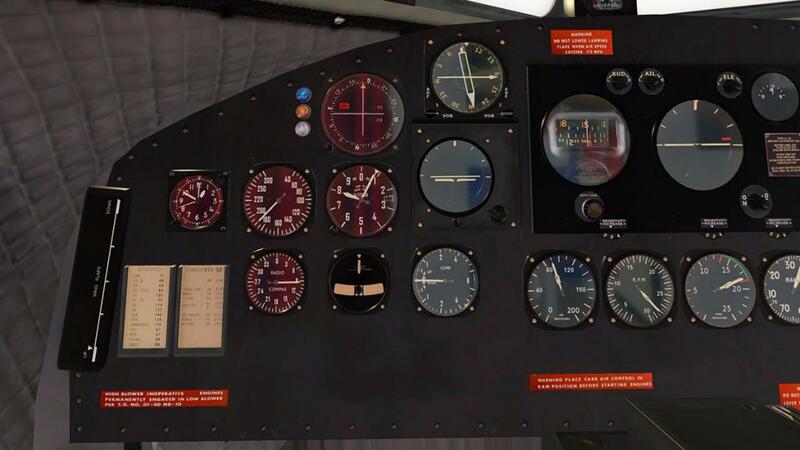 Three dials in RUD (Rudder), AIL (Aileron) and ELE (Elevation) will adjust your flying surfaces, in reality it is just a trim function but one that you can control easier. Turn the ELE and you will see your yoke go towards you to climb, same movement in forward to descend. 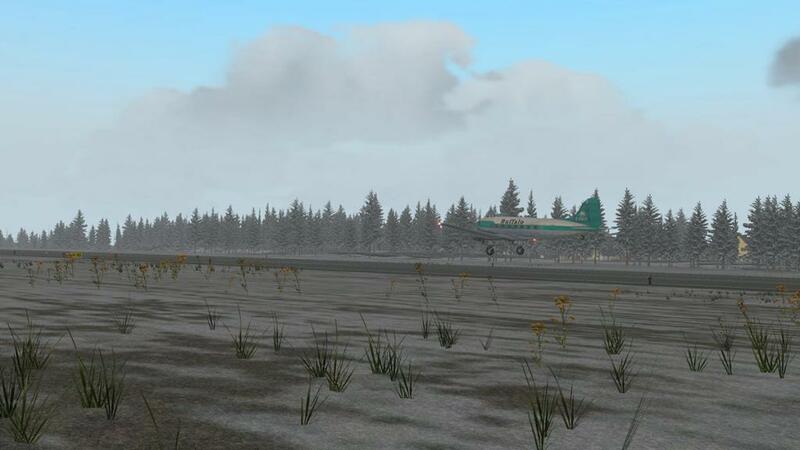 AIL will bank the aircraft to a new heading and so on. It works quite nicely but you have to watch your instruments in that you are going in the right direction and not slightly banking towards another one. 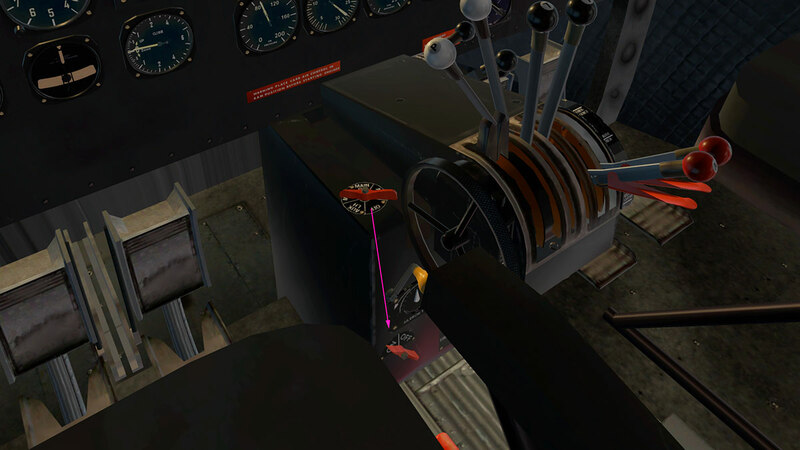 Overall it take the strain out of holding the controls for long periods of time. The DC-3 has a range of 1,500 mi or 2,400 km (1,346nm), which is very impressive, but in most cases around 400 to 500nm is usually the go. Note the built in excellent gyro bank and climb instruments, and they work as real too. This is vintage flying. You are certainly not going to get anywhere very fast, but there is a sort of trundling along with the engines pounding away on mostly on all cylinders in the background, the excellent XPRealistic Pro giving the old bulkheads and window frames a constant shake and everything feels quite nice with the world. 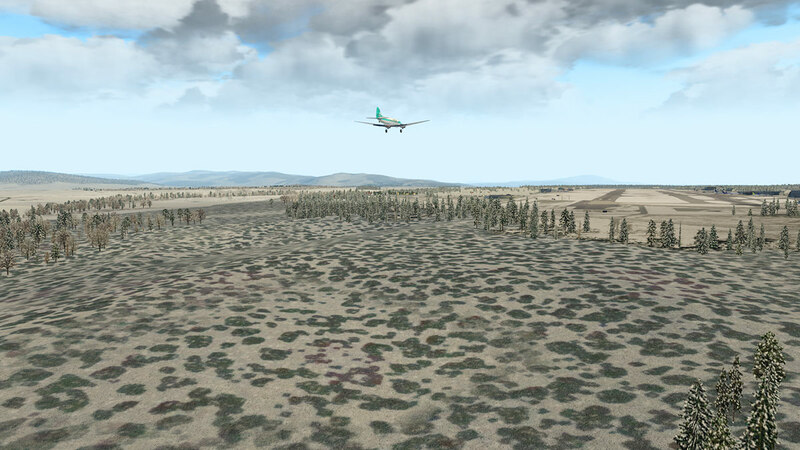 Sounds are not to bad actually, but VSkyLabs has noted that FMOD sounds are coming soon (to X-Plane11) and that will be certainly a great addition to the all round aural experience. Could this be called "Classic" flying, I think so as the world sorts of moves by rather than flies by under the aircraft and at only being 8500ft up you get to see a lot more of the landscape. 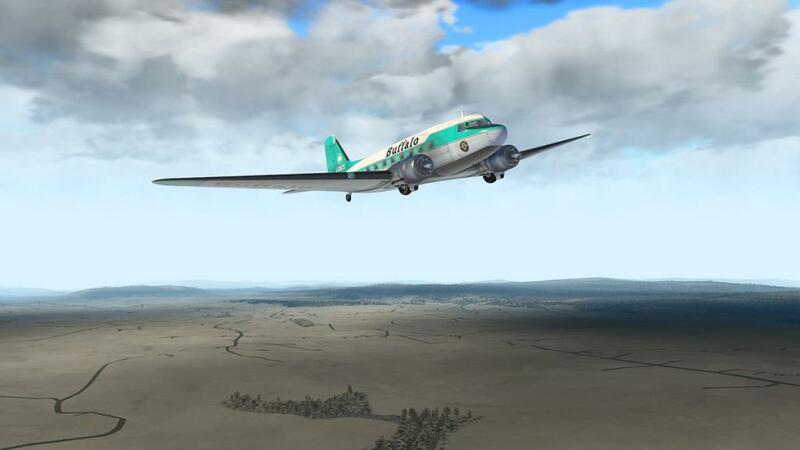 If you are familiar with PMDG's DC-6 you will understand most of the actions here also, so you will feel quite at home in either aircraft, the DC-3 is certainly easier to fly than the bigger DC-6, but feeling is the same. 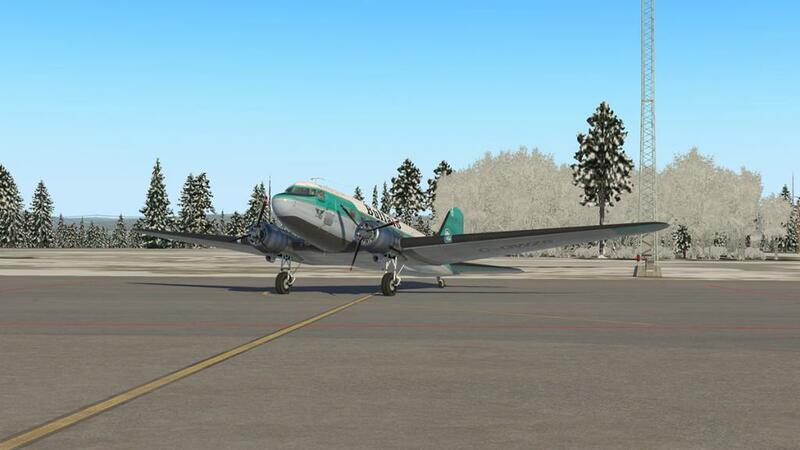 The DC-3 is known as a pilot's, pilot's aircraft. 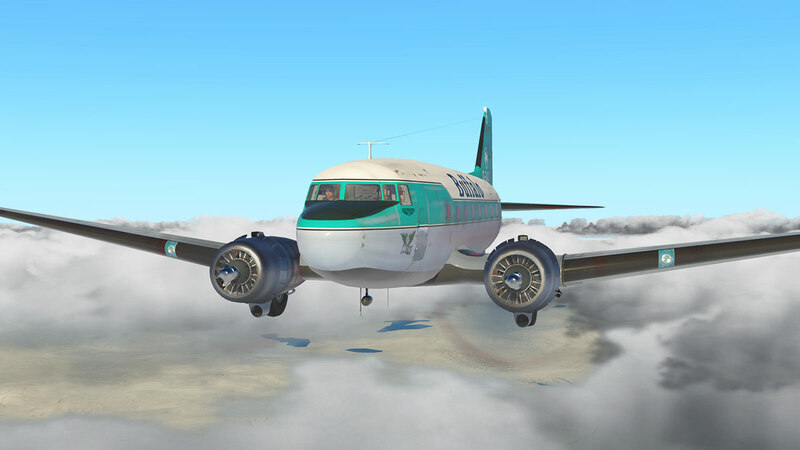 And I can understand that, as the bird is very hands on, but more to the point you feel the DC-3 in the way you fly it, well trimmed it is a nice aircraft to manoeuvre as long as you understand it's limitations and performance. 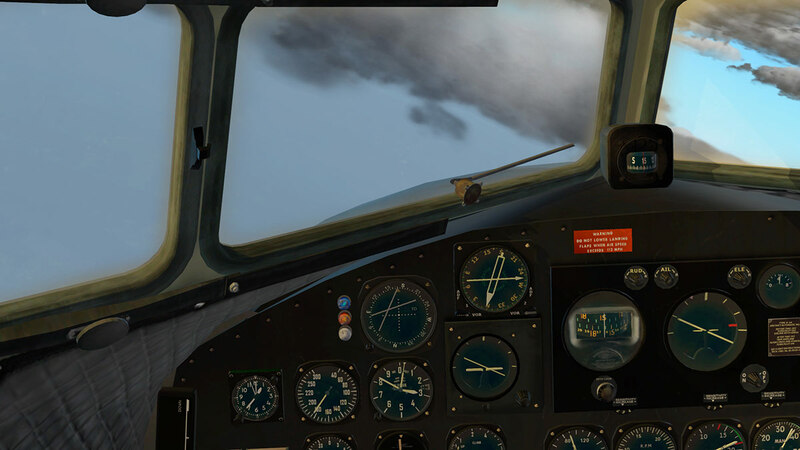 Overall the aircraft is very addictive, in that fly it once then you just want to have another go and in that aspect VSkyLabs has got something very right here. 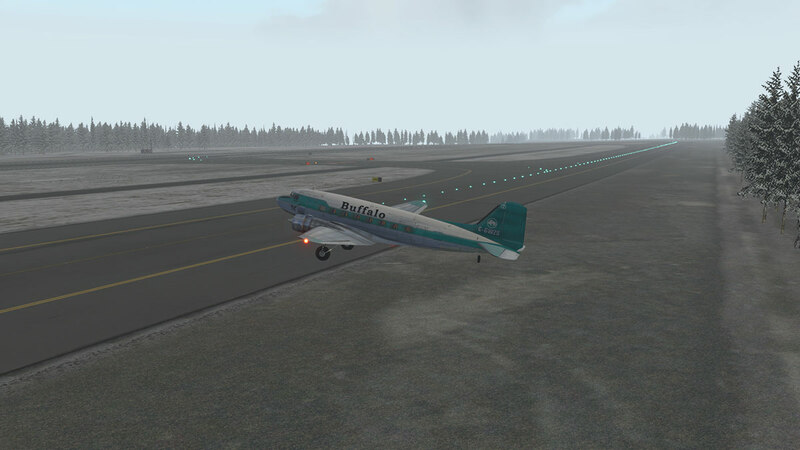 The DC-3 is nice to manoeuvre when setting up for landing. "Hands on" is the thought that comes to mind, but you know you are in control. 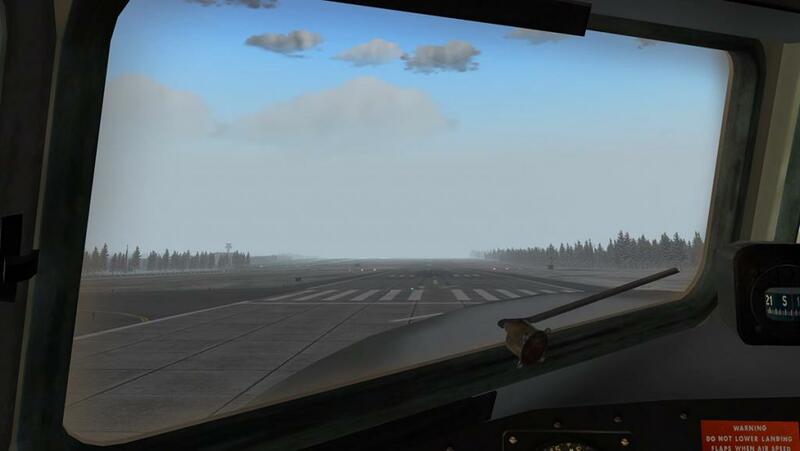 Flaps are not stepped but continuous, so you have to hold the lever down all the time to drop them, but harder is that they can only be used at around or under 100mph, so you have to get down to that speed before using them... and it is harder than it sounds. Once there you can then actually lower the flaps and then they provide their own drag to adjust your approach speed, so then it becomes a balance of flap drag vs throttle thrust to keep the approach correct. Stall is around 60mph so 80mph feels about right. ... you are very conscious of your tail. 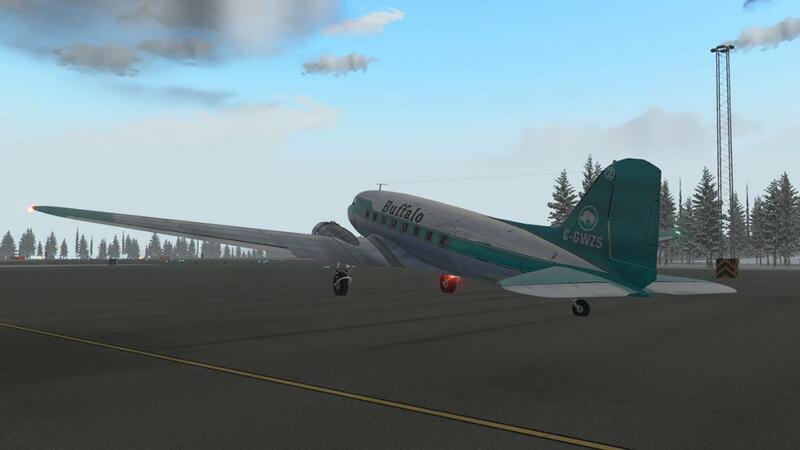 Even in light crosswinds the DC-3 can be very tail light and of course we have all seen the great footage of these taildraggers in real action in heavy winds, and then they are a real handful. 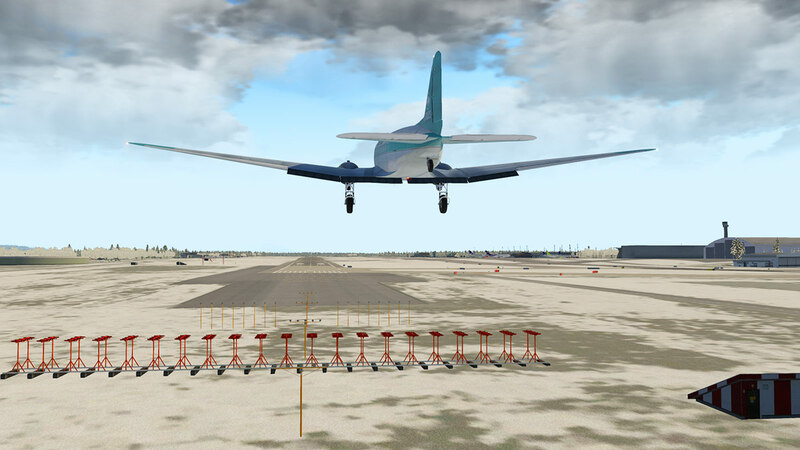 But once you are over the threshold you have to learn to straighten up the tail by instinct before you put the aircraft down, so yes using the float point is a great benefit to you if you can get it right, so you hold, straighten then hold it tight and reduce the speed to meet the runway. 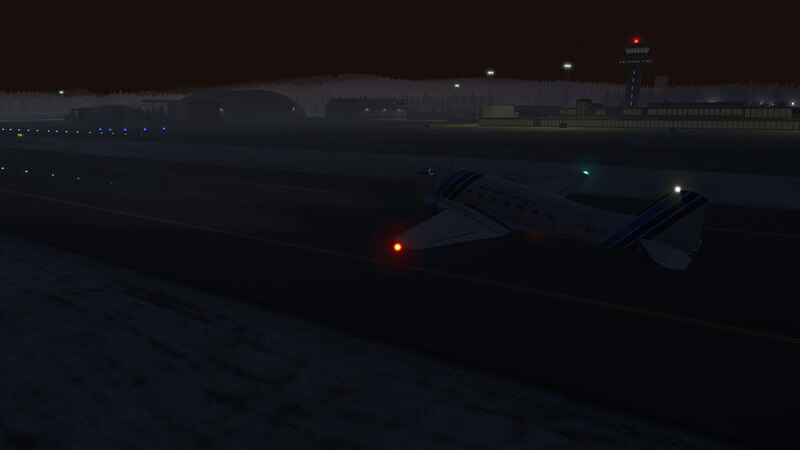 It took me a few landings to get it perfectly right, but then it just becomes a background natural instinct and feel. 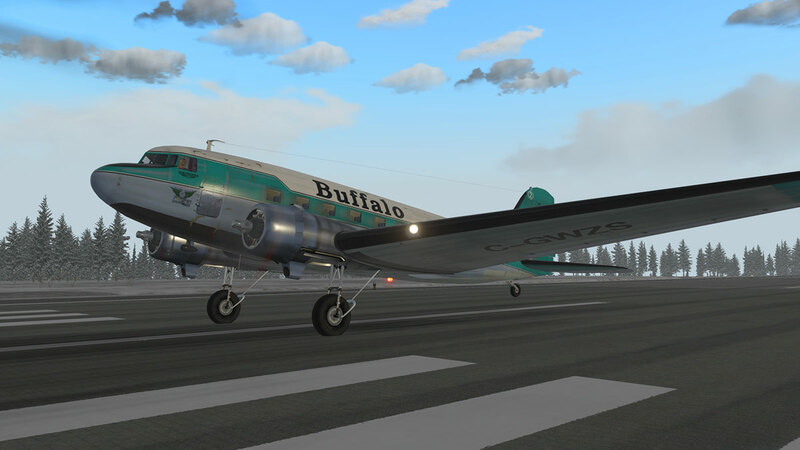 As to be expected the lighting on the DC-3 is basic. External lighting is not adjusted, but it is effective. Note the high light on the tail. 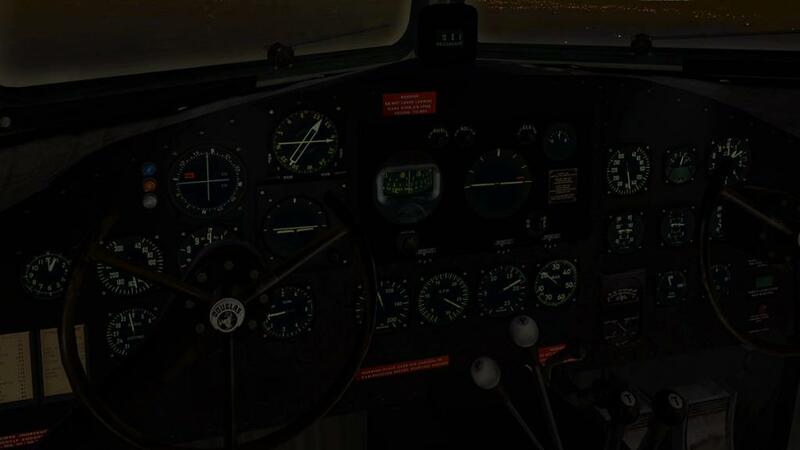 Instrument panel lighting is not overly dramatic, but it is easy to use and t actually read at night and so in that case it is effective. 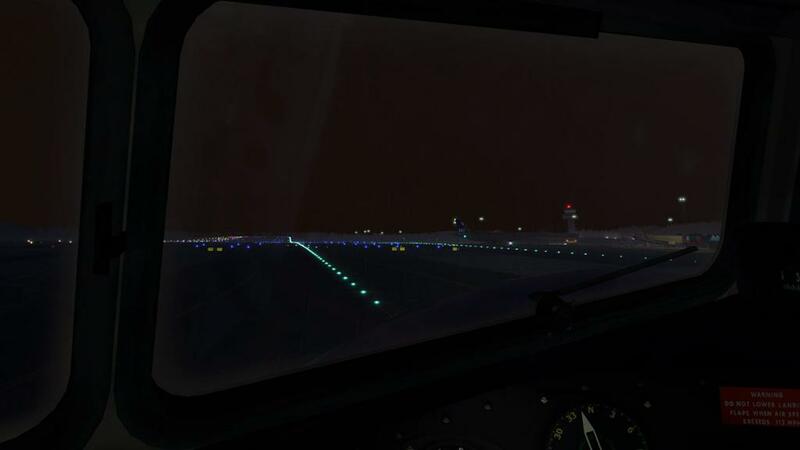 Taxiing at night is a pretty dark affair, but it does feel very authentic, the frosted old windows certainly help a lot to the atmosphere. Overall a bit more work is required here. 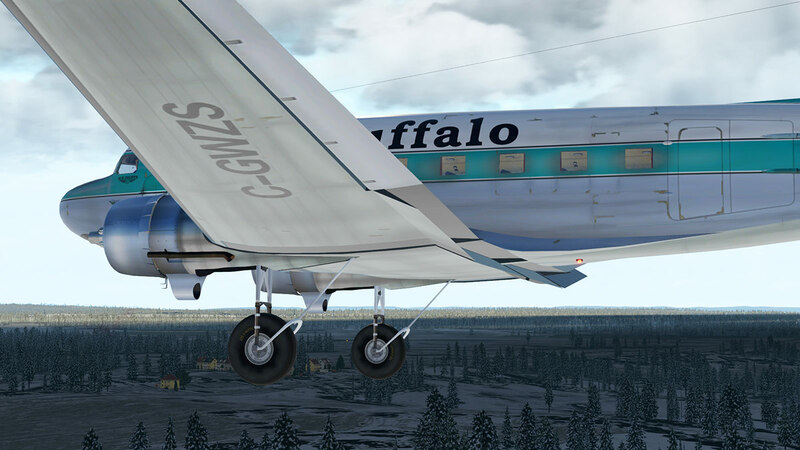 As noted the only livery is provided is the Buffalo Airways which was created originally from "Flightgear Liveries" but with permission is now part of the project. 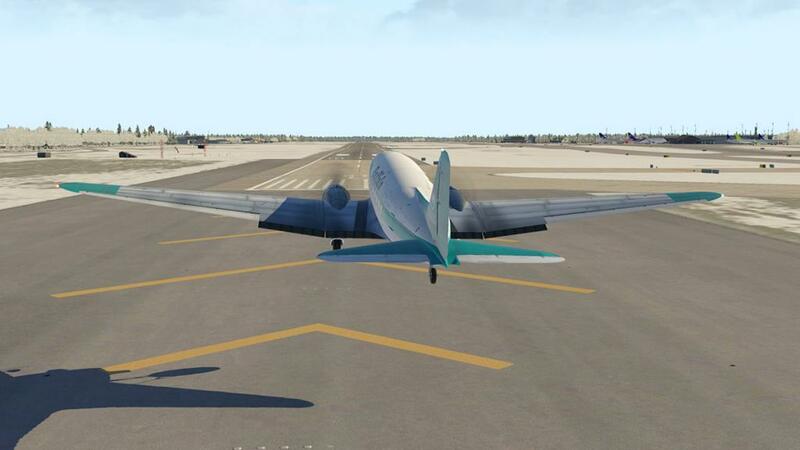 And if you want to you can convert more for the aircraft from the Flightgear site. 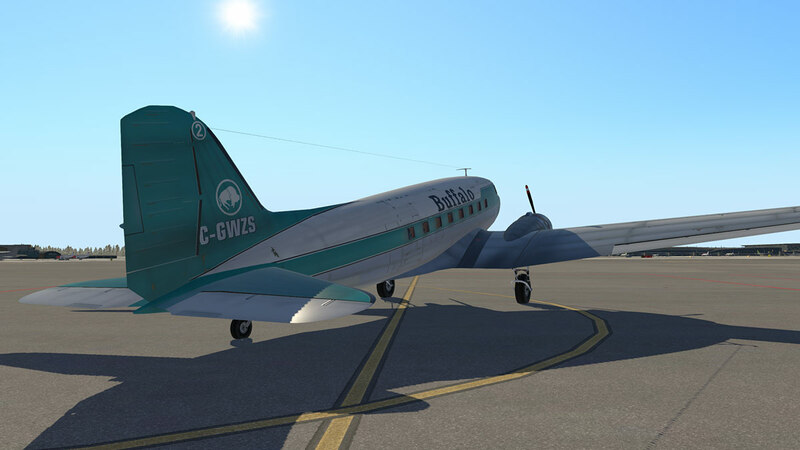 It took me about 20min to do about four... in a very nice Air Atlantique, BUA, CP Air and a Chilean Airforce livery. 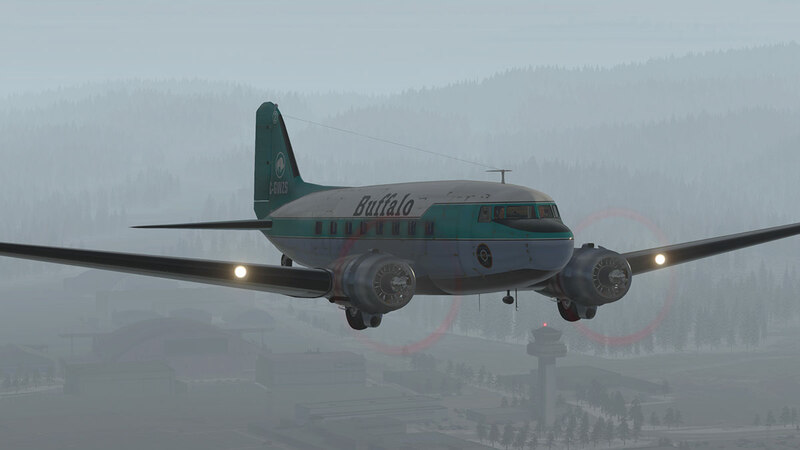 They are (very) basic and there are sadly currently no Military C47 liveries in the list. 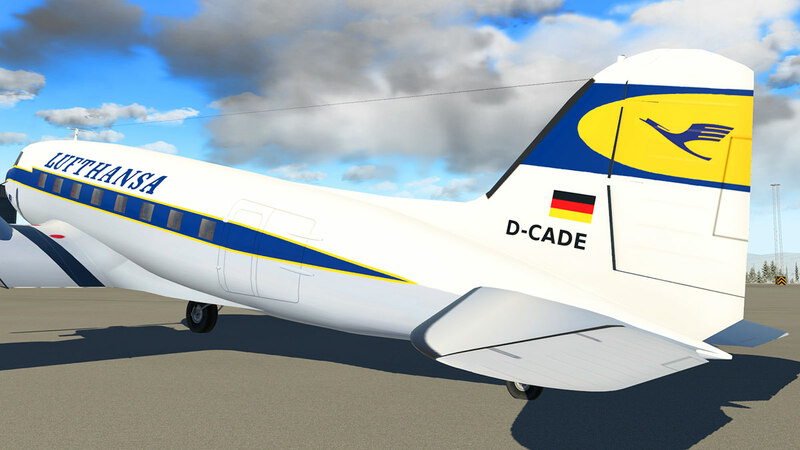 There is a paintkit here on the X-Plane.Org. One livery for Lufthansa (below) has already appeared so there is no doubt this aircraft will attract a lot of painters. It is in the liveries that others can help this project as to throw some serious talent at these liveries would certainly lift the already underlying good aircraft. A final note that this review was completed with the v001.1 update that has a had a lot of changes since the release version. A few images in here were still from the original release version (mostly the reflective instruments). Any new purchase will download the v001.1 version, but if you haven't then do so as the update is significant. 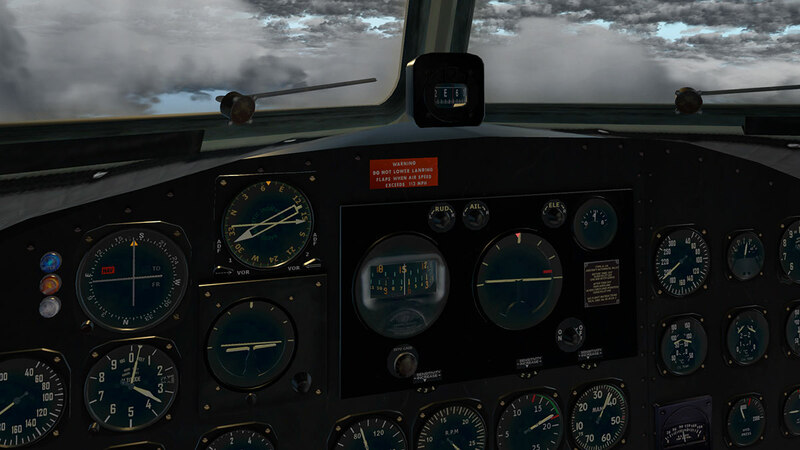 Another point is that I highly recommend both a twin-throttle system and the use of XPRealistic Pro by rk Apps effects as they both are a huge bonus in flying this aircraft. 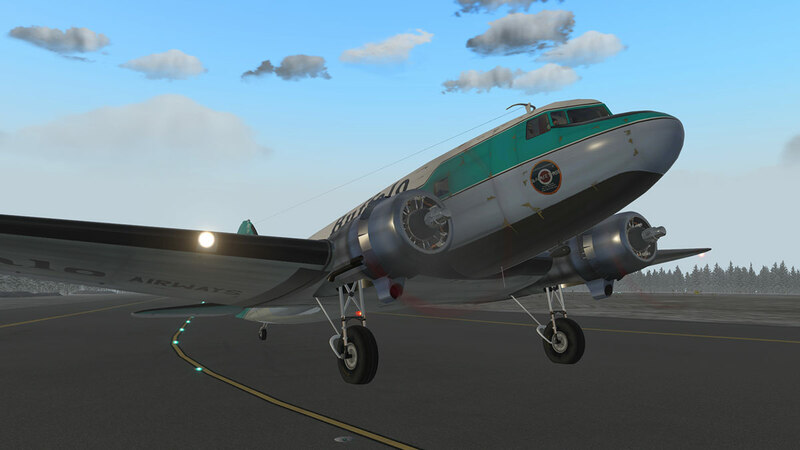 To be clear what you are purchasing with this VSkyLabs DC-3/C47 aircraft is a project still in progress, an advanced one, but it is still far from the completed aircraft. 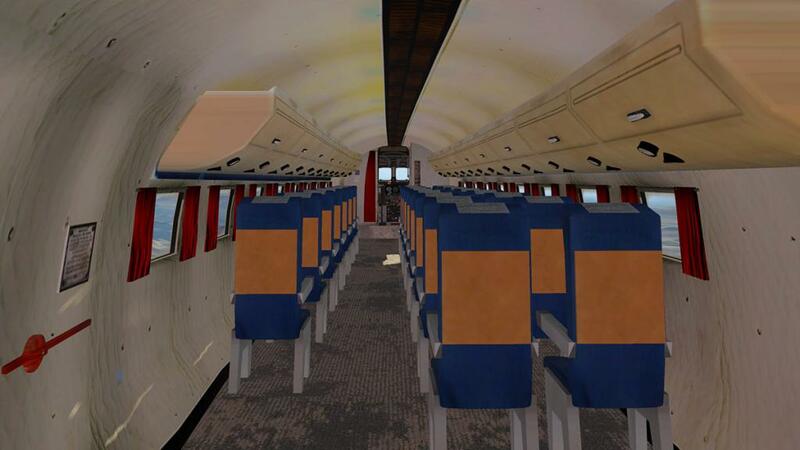 There are no special features in menus or elements and the cabin is really also still not fully completed. 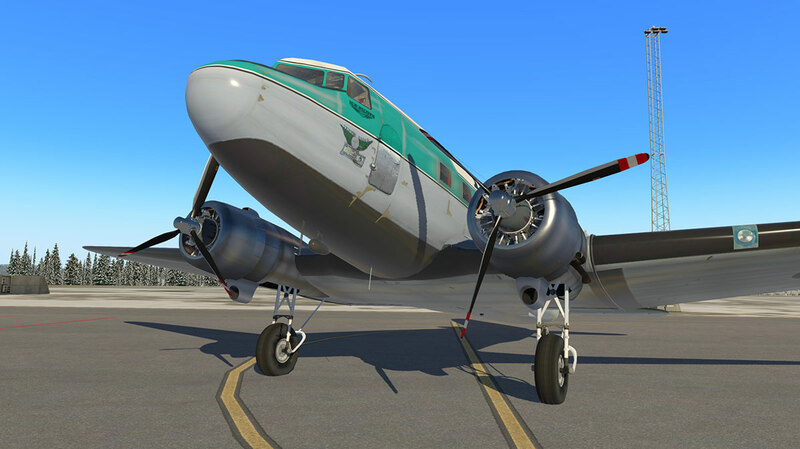 This is also not a deep simulation in the way you would totally operate a DC-3 either, certainly not in the systems and in some areas the operation and the price which is set below US$20 does reflect that. 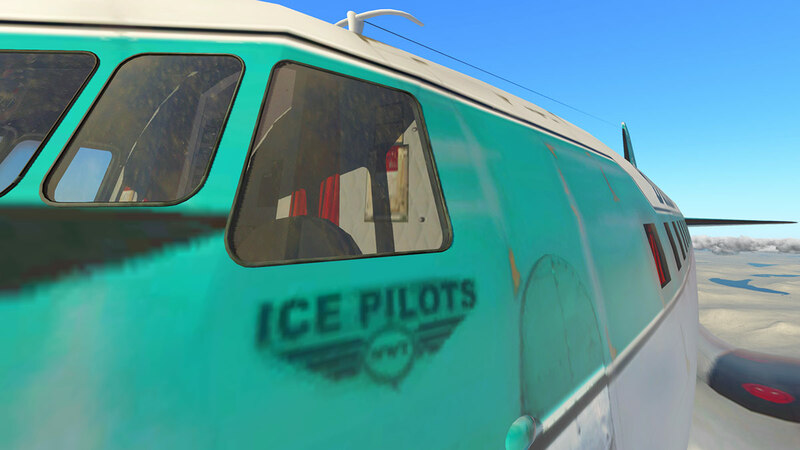 The liveries are also quite basic, but workable. The normal mapping is also basic (the textures that highlight pixels to make lines and grooves on the aircraft) and it is here that I think most visual improvements could be made. You want to see every rivet and panel in it's glory as these older aircraft are built that way, and this missing visual aspect is noticeable. Certainly X-Plane11 goes a long way in bringing up great lighting and saving an aircraft which could have be quite dull without it, so in X-Plane11's light the aircraft does look quite nice and interesting and it does show the potential of what can be yet added to this aircraft as the basics are excellent. If you accept the above then you will take the aircraft to your heart. 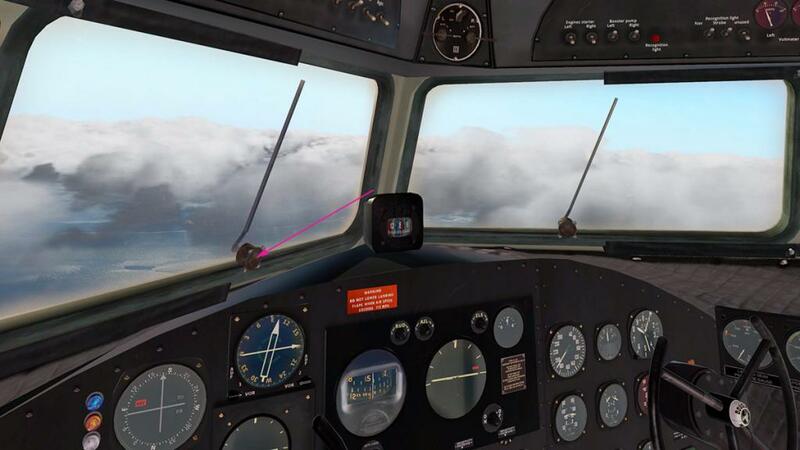 It is a great aircraft to use and fly, and very hard to ignore and even addictive, actually very addictive in the fact the more you fly the aircraft the more you want more of it. It can be tricky of course, but again all these sort of taildraggers are interesting machines... but that is all part of the fun as well. So what you get here is a great deal, a great if even one of the really greatest aircraft of all time to fly and enjoy and I can guarantee you now there are already a lot of X-Plane pilots out there with a wide grin on their faces as they trundle around the slow moving landscape with a beating heart of happiness, not even money can provide that, so get with the project and be a part of the movement to thoroughly enjoy the ride along the way. 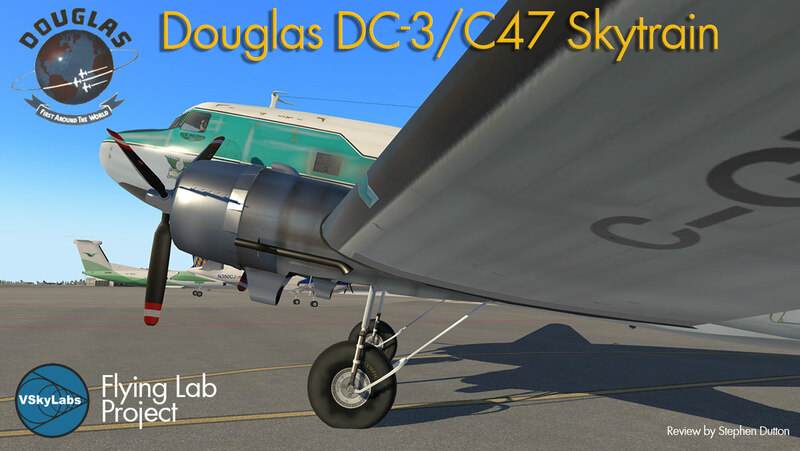 The VSKYLABS DC-3/C-47 Flying Lab is a project under constant development. All updates are free. There are no documents, but recommended there is a full suite of original Douglas manuals at "www.avialogs.com" but you have to pay to access them. T.O. 01-40NC-1 Pilot's Flight Operating instructions C-47 Airplane. T.0. 1C-47B1 Flight Handbook C-47B - C-117A -R4D6. A.P. 2445A & C - PN - Pilot's notes for Dakota I & III. AAF Manual 51-129-2 Pilot Training Manual for C-47 Skytrain. Pilot Training manual for the C-47. A.P. 2445D-P.N. Pilot's Notes for Dakota IV. C-47D Skytrain Characteristics Summary - 26 September 1952. T.O. 1C-47(A)D-1 Partial Flight Manual AC-47D. 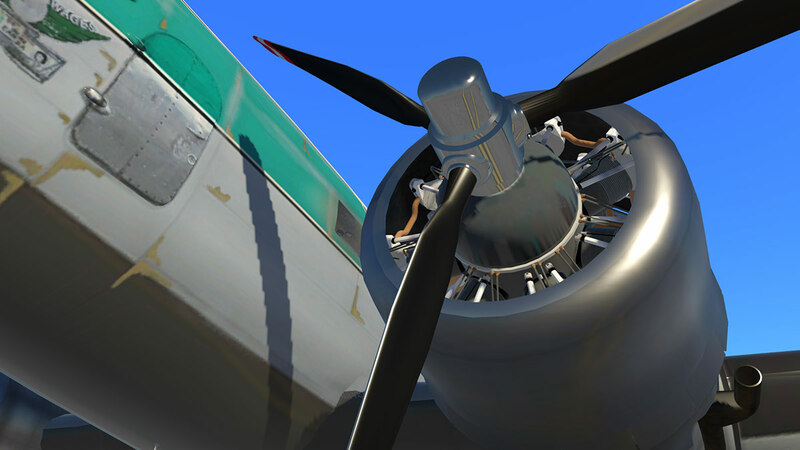 Strength and Operation of DC-3 Airplanes. 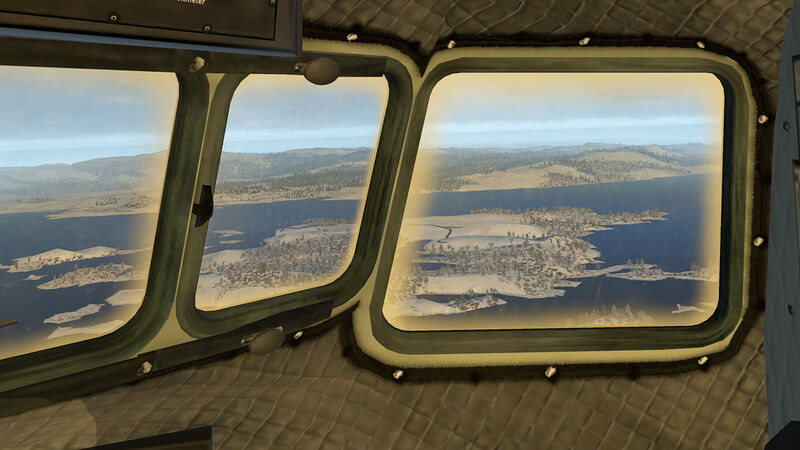 Note the winter textures by xFlyer called Winter_Package or Simple Seasons with the MODS program was used to create the winter scenario for this review.